Salah statue draws online ridicule | Daily Express Online, Sabah, Malaysia. 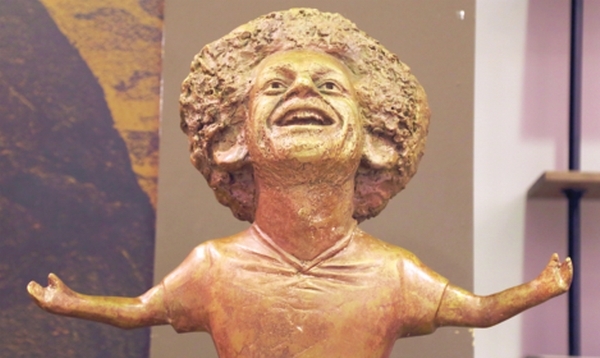 CAIRO: A bronze statue of Mohamed Salah unveiled Monday at an international youth gathering in Egypt has been criticised for its poor resemblance to the Liverpool striker.The statue depicts Salah with a disproportionately large head and small arms stretched in the celebratory pose the 26-year-old Egyptian took in the latter part of last season. The figure, made by artist Mai Abdullah, has Salah's trademark curly hair and is standing on what appears to be a pot for plants. Salah has not spoken publicly about the statue and Abdullah was not immediately available for comment, but the artist defended her work in a Facebook post, saying the statue was made as part of an online programme to teach sculpting. "The negative comments will not frustrate or have an effect on me, but I do hope that people would learn the art of polite and respectful criticism," Abdullah wrote in response to a wave of ridicule on social media.